One hundred years ago, women in New York State won the right to vote. Five Ithaca College students recently saved the centennial celebration of that historic event in the town of Lisle, where the first women in the state voted. Former Lisle Free Library historian Carol Gorham had planned to create informational materials for the commemoration, but unexpectedly passed away over the summer, leaving the event in jeopardy. Library board member Katharine Kittredge, an English professor at Ithaca College, wanted to help save the celebration. She reached out to students interested in women’s history and graphic design, who then stepped in to bring the centennial celebration back to life. The team of students, led by Naomi Hanson ’19, included Alexandria Paul ’19, Clare Nowalk ’20, Julianne Grillo ’20 and Jackie Marusiak ’21. They had just one month to prepare. 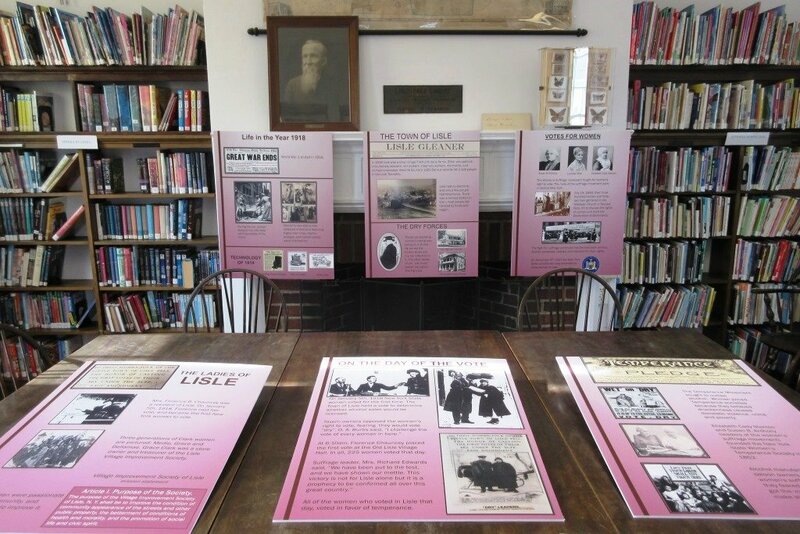 The students took over many of the important roles for the event, including researching the history of women’s suffrage in New York and gathering images from the local archives to design educational posters and pamphlets. Historians who came to the Oct. 21 event praised the students for the professional quality and accuracy of their work. Kittredge commended the team for their hard work and dedication to the project, since it wasn’t done for course credit or recognition, but for their love of history.